Fantastic Beasts: The Crimes of Grindelwald wants to know, who will stand against the darkness? In the very likely event that the evil Gellert Grindelwald (Johnny Depp) escapes from his wizardry imprisonment, and follows through on his malevolent plans, it will most likely have to be Newt Scamander (Eddie Redmayne) to thwart it. And we get a sense of the impending doom that is about to befall in the first trailer for Fantastic Beasts: The Crimes of Grindelwald. Check it out below. 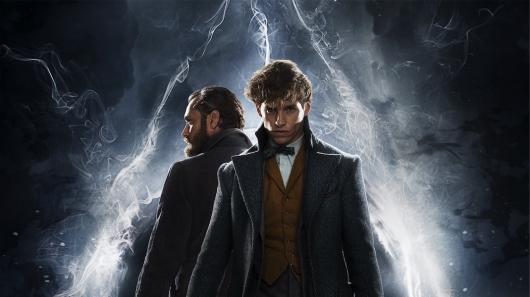 In it, we see the return of Newt, who has been sent on a mission, by Dumbledore (Jude Law) to investigate and prevent Grindelwald from succeeding with whatever plans he has for the wizarding world. Newt will be reunited with his fellow wizard Tina (Katherine Waterston), and everyone’s favorite couple from Fantastic Beasts and Where to Find Them, the No-Maj Jacob (Dan Fogler) and the mind-reading Queenie (Alison Sudol). These films promise to be a global experience. The first of these films took place in America, with the upcoming sequel taking place in Paris. So it should be interesting to see if France has a different magical community than those in America or England. I can’t say that I am well-versed in anything Harry Potter, but I did like Fantastic Beasts and Where to Find Them. The franchise already had plenty of world-building potential since it was based on the already successful Harry Potter films. But the fact that this takes place earlier than all of that and will have characters go on a global adventure opens up the doors for a very entertaining experience for both the fans and non-fans of the film. The film also stars Zoë Kravitz, Callum Turner, Claudia Kim, William Nadylam, Kevin Guthrie, Carmen Ejogo, and Poppy Corby-Tuech. Directed by David Yates, from a script written by J.K. Rowling, Fantastic Beasts: The Crimes of Grindelwald will open in theaters on November 16, 2018.